“Jesus said, ‘I have come to set the earth on fire, and how I wish it were already blazing! '” (Luke 12:49). Thanks for your interest in LITTLE FLOWER CATHOLIC PARISH. 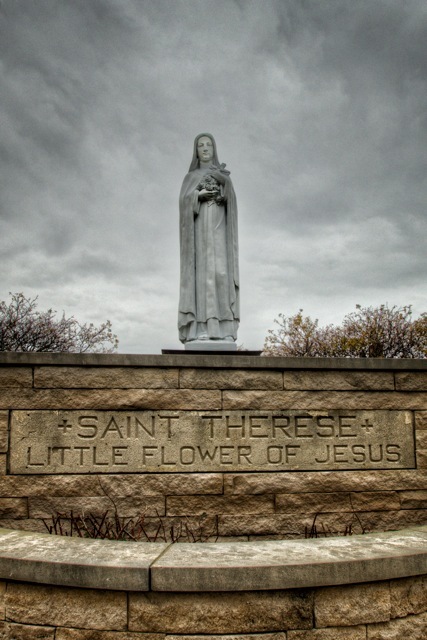 Declared a saint to the entire world by Pope Pius XI in 1925, a few years thereafter Cardinal Samuel Stritch established us as the first parish in the Catholic Diocese of Toledo dedicated to Christ Jesus in special memory of Saint Thérèse of Lisieux, the Little Flower of Jesus. As CATHOLIC CHRISTIANS, we hold that all people are created by God to live purposefully and joyfully. After His Resurrection, JESUS breathes on the disciples – his followers – and declares, “receive the Holy Spirit” (John 20: 22). Only after having received the HOLY SPIRIT does Jesus send them out to change the world by seeking to lead those whom they encounter ever closer to the heavenly FATHER. They are instructed to teach God’s commandments clearly and to live confidently that the Lord remains always among us (Matthew 28:20 ). In the person of Jesus Christ and through the Church He founded, we receive all the gifts that are essential for a full and abundant life. SACRED SCRIPTURE – God’s Holy Word – is essential to who we are – it’s in our prayer, in our liturgy, in our meditation. TRADITION is important to who we are as it is seen in the great works of Christian artists, poets and writers all of which is meant to break open the beauty, goodness and truth of God’s Word in Sacred Scripture. LITURGY – or worship and praise of God – is our defining activity. And at the heart of the liturgy is the HOLY EUCHARIST. We believe that Jesus Christ is present among us in the Holy Eucharist (John 6:51-58). SACRAMENTS, seven sacred events that Jesus established to be done regularly in His memory, make His life and love personally available to us to strengthen us along our way. We hope to see you at Mass! Father Dave Nuss was ordained to the priesthood on June 12, 1993, and has served as pastor of Little Flower Catholic Parish since July 1, 2012. Originally from Wisconsin he is a spirited fan of the Green Bay Packers, savoring the delights of the great Titletown traditions of his youth along with the more recent team successes. He is a graduate of Marquette University (1988), Mt. St. Mary’s Seminary (1993) and The Catholic University of America (2000). In addition to his having served for many years as a priest and high school teacher in Sandusky (OH), he also has enjoyed special priestly assignments in Archdiocese of Washington (DC), Archdiocese of Cologne (Germany) and is a previous diocesan vocation director and director of priests’ continuing education.